TAIWAN – Liang Island - Further scientific investigation is needed to determine the age of a skeleton recently found on Liang Island located some 200 miles west of Taiwan, according to the Council for Cultural Affairs April 2.The CCA made the remarks after the remains, discovered by a local archaeological team, were believed to date back to as long as 7,900 years ago. 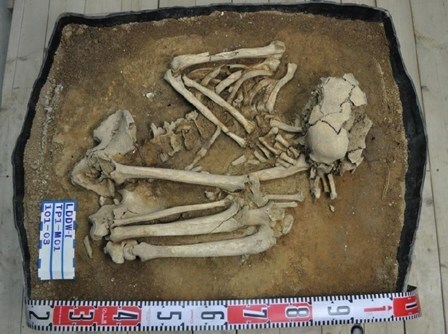 The bones are thought to have belonged to a male, around 167 centimeters tall, who was between 30 and 35 years of age at the time of his death. “We will send the remains to the U.S. and Germany for more professional accelerator mass spectrometry radiocarbon dating and DNA biochemistry analysis,” the CCA said, explaining that “to prevent damaging the remains, only the age of the specimens of shells nearby were identified using the carbon-14 dating method, hence, there is no direct evidence for which era the skeleton is from. “If it turns out that the remains are from the Neolithic era 7,000 or 8,000 years ago, Matsu’s historical status will be rewritten,” the CCA said. Liang Island forms part of an archipelago known as the Matsu Islands, administered by Lienchiang County. TURQUIE – Çatalhöyük - A team working at Konya’s Çatalhöyük district’s archaeological site has revealed temples from the ancient Neolithic (new stone) and Chalcolithic (copper) eras. 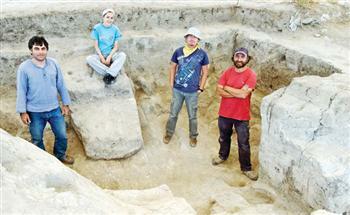 There are two mounds in the district, Trakya University excavation team president, Burçin Erdoğu said. While the eastern part of the mound is from Neolithic era, the western part is from the Chalcolithic era. “We have found the largest Chalcolithic settlement on the Konya valley.” The east of and west of Çatalhöyük have significant differences, said Erdoğu. “The biggest difference is in the architecture,” she said, explaining that the buildings in the Chalcolithic area were smaller than the others. “In the eastern Çatalhöyük section, there are drawings on the walls. These have symbolic importance. There are geometric drawings on the walls. The symbolism is also reflected in the pottery,” said Erdoğu. Noting that it is the first time the team has encountered such buildings, Erdoğu said: “We assumed that the people who lived during that era used this building to hold ceremonies and perform religious rituals.” Human figures have also been discovered drawn on the walls, as well as pottery that was probably used during the ceremonies. “These potteries were found on the Western side of Çatalhöyük,” she said. FRANCE – La Guerche - Les fouilles archéologiques se déroulent route de la Hunaudière, à proximité de la station d'épuration, de part et d'autre de la voie communale, sur une surface d'environ 7 500 m 2. L'emprise se situe sur le futur tracé du contournement par l'Ouest de La Guerche qui, partant du rond-point de la route de Vitré, passera le long de la station d'épuration, coupera à ce niveau la route de la Hunaudière, pour rejoindre la route de Bais et le lieu-dit les Grands-Champs. 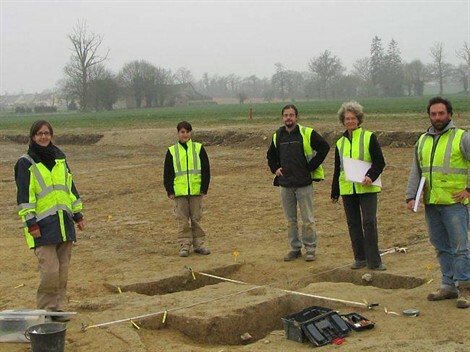 Ces fouilles résultent d'un diagnostic archéologique, réalisé en 2011, à la demande du service régional d'archéologie. Un sondage par tranchée à la pelle mécanique, effectué alors par l'Inrap. Cette évaluation des sous-sols a permis de détecter la présence de vestiges archéologiques. Le conseil général a mandaté la société privée d'archéologie, ArchéoLoire, basée à Guérande, pour mener ces fouilles. Depuis début mars, une équipe de cinq archéologues est donc au travail sur le site. Le chantier doit se terminer fin avril. Pierre Rio, responsable d'opération précise : « Les vestiges seraient datés de la fin de l'Antiquité et du début du Haut Moyen Âge, période de transition importante qui donnera naissance aux règnes mérovingiens ». Les archéologues tentent de dater précisément le site afin de mieux comprendre l'occupation humaine sur ce territoire. « Ce secteur fera partie, au VIII e siècle, de la Marche de Bretagne, zone tampon entre les royaumes francs et bretons. L'époque qui nous intéresse se trouve à la genèse de ce processus », poursuit Pierre Rio. Les vestiges actuellement en cours de fouille sont constitués d'un enclos avec fossé, long de 66 m sur 40 m de large, à l'intérieur duquel s'étendent des bâtiments sur poteaux, formant des unités d'habitations. Une petite centaine de trous de poteaux ont été découverts. Les archéologues ont également mis au jour un four. Ils ont aussi trouvé des fragments de céramiques, qui pourront témoigner des activités quotidiennes au sein de l'enclos. Quelle était la vocation exacte de cet espace ? De quand date-t-il précisément ? Qui étaient les occupants ? C'est à toutes ces questions que les archéologues s'attellent à répondre aujourd'hui. GRECE – Nafplio - The Fortress of Akronafplia is one of the most important monuments of the city of Nafplio, and in recent years has been treated more as a tourist attraction rather than an archaeological site. This is soon to change however, following a decision by the 25th Ephorate for Byzantine Antiquities to carry out restoration works aiming to showcase the monument. Akronafplia, also known as Its Kale (Inner Castle), is the oldest part of the city of Nafplion, and was a town in its own right up until the 13th century. 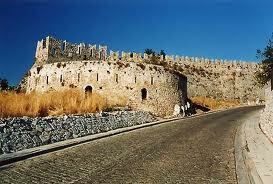 With the advent of the Venetians and Franks, it was incorporated into the city’s fortifications. Later, a part of it was used as a political prison (1936-56), but the Greek government subsequently decided that the view from its location would benefit local tourism and built a hotel complex (Xenia) which still stands there today. The Akronafplia Fortress, the oldest of Nafplio’s three castles, rises above the old part of the city and was the Acropolis of Nafplio. Walls of several eras are saved on it. The lower section of the fortress walls date back to the Bronze Age, while most of the remaining structures were built by the Venetians in the 15th century. CROATIE – Vinkovci - Luxurious antique silver utensils dating back to the 4th century have been found by archaeologists during recent archaeological excavations in the eastern Croatian city of Vinkovci. Because of the value of the discovery, over 50 items, including plates, saucers, bowls, jugs, cups and spoons, with a total weight of over 30 kilograms, are being kept in an alarmed vault with 24-hour police surveillance in Vinkovci City Musuem. "According to our assumptions, the dishes and cutlery found were those of the first tycoons to this area and were used only for major events, and not for everyday use. It can be suggested that the original owners of this equipment really lived a very lavish life," said Anita Rapena Papesa, Deputy Director of the City Museum in Vinkovci. FRANCE - Ile-de-France - Lors d'un contrôle routier à La Ferté-sous-Jouarre (Seine-et-Marne), les douaniers de Melun ont découvert sur le conducteur d'une voiture une pochette en plastique contenant 112 pièces de monnaie et 3 rouelles d'apparence très ancienne. Le service archéologique de la direction régionale des affaires culturelles (Drac) d'Ile-de-France confirme alors qu'il s'agit de biens culturels, pour l'essentiel d'époque gauloise et gallo-romaine, ayant entre 2.500 et 1.500 ans d'âge. Un contrôle au domicile de la personne interpellée permet ensuite de découvrir 2.321 objets (pièces de monnaie, fibules, poteries, céramiques, silex...) pour lesquels "aucun justificatif n'a pu être produit". Selon ses déclarations, ces objets proviennent en partie de fouilles illicites réalisées dans la Marne, la Seine-et-Marne et l'Aube. Après avoir consulté des photos aériennes, l'homme, dont l'identité n'a pas été révélée, se rendait sur des zones précises, muni d'un détecteur de métaux pour fouiller ces zones. Il faisait ensuite "commerce de cette activité notamment via des sites i nternet et des bourses aux monnaies", selon les douanes. GRECE – Fyli - An ancient Greek statue confiscated last month from suspected smugglers and described as «priceless» is actually a fake, a culture ministry source said on Tuesday. "A closer examination found moulding marks and bubble traces, leading to the conclusion that the statue is a copy,» suggesting the statue had been cast rather than sculpted, the official told AFP on condition of anonymity. The 1.2-metre statue of a kore, an archaic maiden, was found last week in a sheep pen in the Fyli district northwest of Athens, bordering the countryside. An inspecting archaeologist said the sculpture was «unique» and of «priceless historical value», police said at the time. But ministry experts later found it was an identical copy of a statue found on the Acropolis in Athens in 1886, down to its missing left arm and lower section. 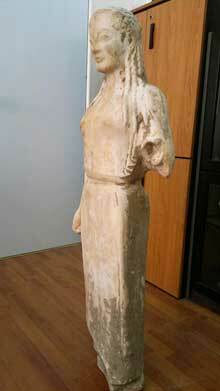 "The responsibility is shared by the police and the archaeologist who evaluated the statue,» the ministry official said. 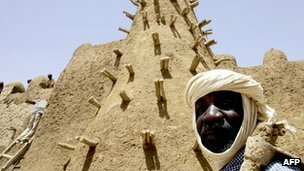 MALI – Tombouktou - The fighting in northern Mali could damage the World Heritage Site of Timbuktu, the UN's cultural agency Unesco has warned. Separatist Tuareg rebels joined forces with Islamist fighters to take the town on Sunday, and residents have told the BBC that Islamic law is being imposed. Timbuktu - on the edge of the Sahara desert - is littered with impressive architecture, using mud and wood in a unique style. Structures include the great mosques of Djingareyber, Sankore and Sidi Yahia and 16 cemeteries. Once an important centre of Islamic study, Timbuktu is home to about 700,000 ancient manuscripts, held in approximately 60 private libraries. "At its zenith in the middle of the 15th Century Timbuktu was known all over the world as a repository for all sorts of knowledge, including Arabic Islamic writing, science, maths and history," Lydia Syson, an expert on Mali, told the BBC.